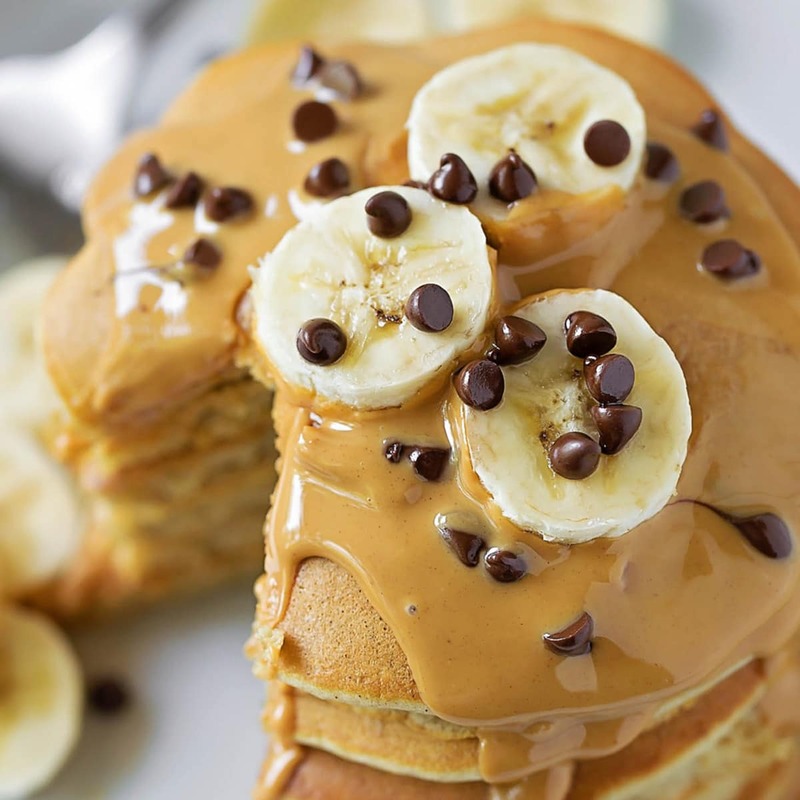 These delicious and fluffy banana pancakes are topped with melted peanut butter, bananas and chocolate chips making them irresistible. 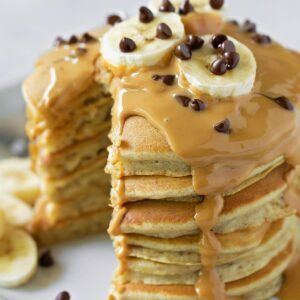 Omit the bananas, and you have delicious peanut butter pancakes! My college room mate always makes fun of me for posting banana recipes, but we ALWAYS have a few spotted bananas on our counter. 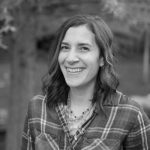 While I love banana bread, sometimes it gets old. That’s when we make pancakes! These light and fluffy peanut butter pancakes are a family favorites. They only take a few minutes to make and they always come out tasting amazing. I tested this recipe with peanut butter swirled into the batter and honestly, I wasn’t a fan. What we loved was melted peanut butter (literally melted in the microwave until silky smooth) in between the pancakes and then drizzled all over the top. It’s like a thick, luscious syrupy frosting. Amazing, seriously!! Of course our kiddos requested a sprinkle of mini chocolate chips and some extra banana slices for the top. Totally optional but highly recommended. If you aren’t a fan of the banana and PB combo, omit the bananas and just add the melted peanut butter and chocolate chips on top. It’s so good! You’ll start by mixing the dry ingredients together. All you need is flour, baking soda, baking powder and salt. Then whisk in the wet ingredients until a lump batter forms. Remember- lumps make for tall, fluffy pancakes. DO NOT OVERMIX! Once the batter is mixed up, let it rest. Yes, let it sit on your counter for 10 minutes. I love this trick, it helps activate the leavening agents and thicken up the batter. 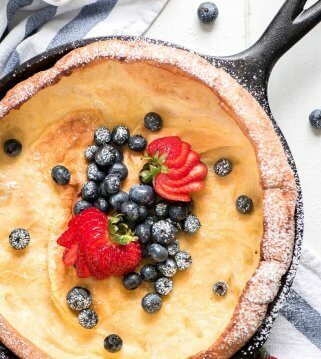 Sky-high pancakes? Yes please! This little insider tip will make you feel like a pancake pro. While your pancakes are on the griddle, prepare the peanut butter. It’s so simple. Transfer a half cup of your favorite creamy (smooth) peanut butter to a microwave-safe bowl and warm on half power for 30 seconds to 1 minute until it resembles the consistency of melted chocolate. Once the pancakes are done, layer them, adding a drizzle of melted peanut butter between each pancake. Drizzle the top and add mini chocolate chips and sliced banana if desired. 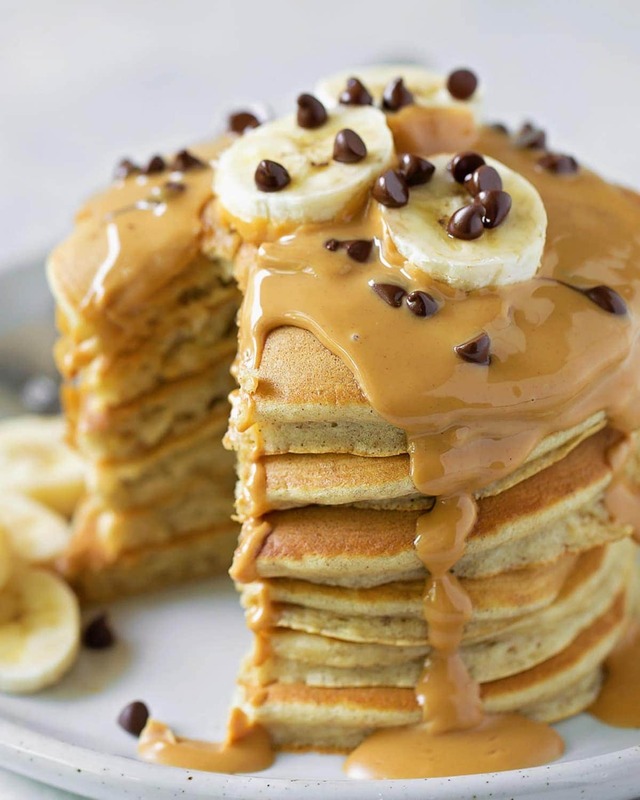 There’s no need for syrup on these peanut butter banana pancakes. They’ve got that sweet salty combo going on. Absolutely perfect for busy mornings or lazy weekends. Kid love them and adults do too! In a medium mixing bowl, whisk together the flour, baking powder, baking soda and salt. 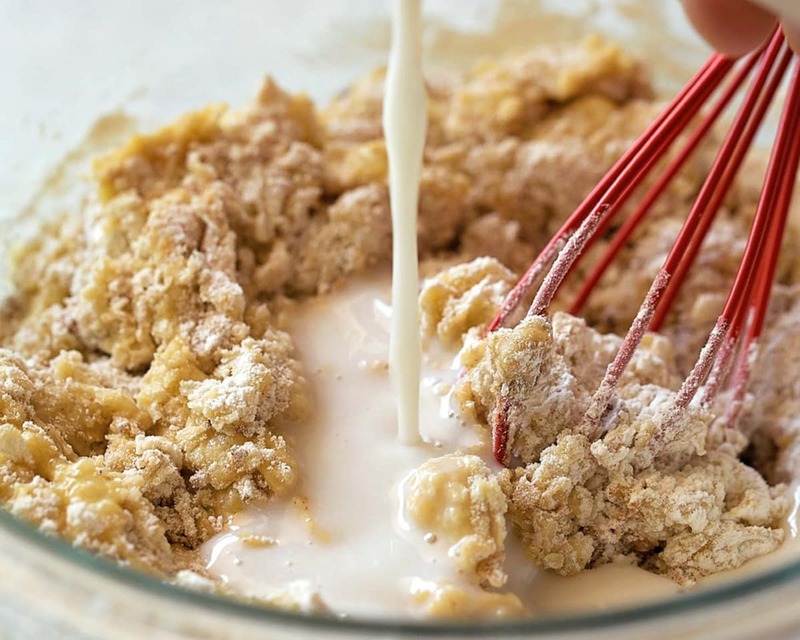 In a small mixing bowl, add the buttermilk, mashed banana, brown sugar, egg, vanilla extract, and melted butter. Lightly beat until combined. Add the wet ingredients to the dry ingredients and mix until just combined, being sure to not overmix. Lumps make for fluffy pancakes! You may need to add a tablespoon or two of additional buttermilk to get the right consistency. Allow the batter to rest for 10 minutes, meanwhile, place a large pan over medium heat and add ½ tbsp. of butter. Scoop the batter out using ⅓ measuring cup and pour into the center of the heated pan. Allow the pancakes to cook approximately 2 minutes or until you see small bubbles on the surface of the pancake. Flip, and cook for 1-2 additional minutes. 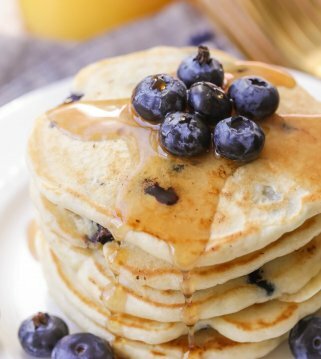 The pancakes should be lightly golden brown in color. Drizzle melted peanut butter between layers of pancakes. Sprinkle with mini chocolate chips and top with banana slices, if desired. Warm your peanut butter by adding it to a microwave-safe mixing bowl and heating on half powder for 30 seconds to 1 minute. The perfect weekend recipe! We love having breakfast for dinner too! Breakfast for dinner is the best 🙂 Let me know what you think, if you try them! Um, yes please! This sounds SO SO SO GOOOOD!! Thank you!! They are! Hope you try them soon! Thank you!! They taste amazing! Hope you like them! What a great combination of flavors! Can’t wait to try this! Thank you! I can’t wait for you to try it 🙂 Hope you like them! I loveeeee that you added warm peanut butter and chocolate chips on top. 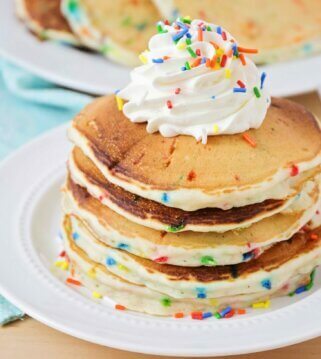 That takes these pancakes over the top! I agree!! Love adding to pancakes 🙂 Thanks so much! So my hubby woke up wanting these pancakes! I was so excited to try them but for some reason they came out Uber liquidy and didn’t cook appropriately in the pan. My husband double checked the recipe and we can’t figure out where we went wrong. Bummed. That’s interesting. I am not sure why, either? They shouldn’t have. Made this for my wife and kids- the recipe calls for 1/4 cup of FLour, should that be 1 1/4? Batter was super wet, added that extra cup and they turned out great! Yes, sorry..I will need to fix that! Thank you! These are delicious, but please fix your recipe. Flour should be 1 1/4 cup. I also added some cinnamon and they were very good. Will DEFINITELY make them again.